Dentures are removable replacements for your missing teeth, designed to look and function like your own natural teeth and surrounding gum tissues. They are generally made from an ultramodern acrylic material which is high-strength and durable. If you look after the dentures then this material is unlikely to stain or darken and will remain fresh and natural looking for many years. The fact that we provide comfortable, natural-looking dentures is a real benefit to those people who no longer possess their natural teeth but for whom socailising and showing a confident smile is very important. Our modern knowledge and techniques will ensure that dentures from ‘Edlesborough Dental Practice’ look great and feel comfortable, allowing patients to eat with confidence. 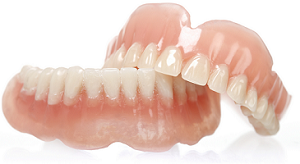 We offer variety of dentures to suit most budgets. If you have several missing teeth, possibly from some time ago, then you will benefit from having dentures as they will provide support for your cheeks and lips. Dentures can reduce the amount of lines and wrinkles around your face, this can literally take years off your face. Dentures are of three types: Complete Dentures, Partial Dentures and Implant Supported Dentures. The dentures that replace all the teeth are known as Complete Dentures and they rest on the gums that cover the jawbones. The stability and retention of these dentures can be improved by attaching them to Dental Implants. Candidates for complete dentures have lost most or all of their teeth. You can have a full denture on your upper or lower jaw, or both. Complete dentures are also called “conventional” dentures. Dentures that replace some but not all of the teeth are known as Partial Dentures. They attach to the teeth that are still present and cover and rest on the gums and bone where the teeth are missing. Dental Implants can also be used to stabilise partial dentures. A partial denture fitted in the spaces created by missing teeth prevents other teeth from changing position. A partial denture is suitable for those who have some natural teeth remaining. Replacing missing teeth is very good for your appearance as well as your health. A denture will help you look better by providing the support that your cheeks and lips need. Without this support, sagging facial muscles can make a person look older. At ‘Edlesborough Dental Practice’ each set of dentures is personalised to your gums, lips, tongue and your whole mouth. Having good-looking teeth also gives you more confidence and freedom to smile. If you have any specific question about Dentures please fill our contact form or call us on ‘01525 223175’. Use our online consultation booking tool to book your initial consultation.